The Armchair Adventurer: Told you so! Yep. I knew it. It's always the same. 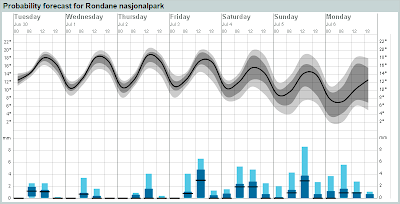 Checked out the long range forecast for Rondane again. They've blown the dust of the grey cloud and raindrop pictograms and are using them wit abandon in the first days of July. Guess I'll be packing the rain pants after all. On the up side, it'll feel like I'm going home!